The Autism Spectrum Disorders - Canadian-American Research Consortium Invites You to Participate in ASD Research! ASD-CARC is an international, multi-disciplinary team of more than 70 researchers and clinicians working with over 3000 families in Canada and the United States dedicated to Understanding the Autism Spectrum. The Autism Diagnostic Interview--revised is one of the "gold standard" diagnostic tools for autism spectrum disorders. It is traditionally administered face-to-face. Since 2003, ASD-CARC researchers have conducted ADI-R interviews for 746 different subjects in 578 of our research registry families. While many were done in face-to-face interviews, the majority were conducted by telephone due to widespread geographical locations of our participants. A telephone interview was thought to be a reasonable alternative, but prior to our study had not been examined for reliability with face-to-face administration. However, thanks to some very dedicated parents in our research registry who completed both a face-to-face AND telephone interview, we were able to compare the reliability of these two different methods. Results indicated that there was no significant difference between the scores or the diagnoses arrived at for face-to-face and telephone administrations and indicated that telephone interviews using the ADI-R are a viable option for researchers. Our Autism Training Program began in 2005 and continues to encourage and support graduate students and post-doctoral fellows from various disciplines to specialize in Autism Research. We were also fortunate to have many undergraduate students work with us this past summer. 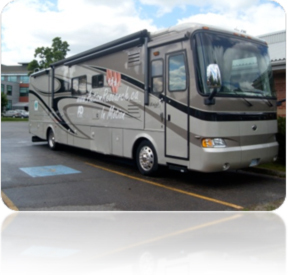 During the Summer of 2010, our Mobile L ab – Autism Research in Motion – travelled to several locations in Ontario, involving families in our research. Families provided saliva samples for genetic studies, participated in EEG studies that examined brain waves detected while looking at a series of pictures, eye-tracking studies that followed exactly where the participants were looking, “sniffin’ stix” studies where participants “sniffed” magic markers with different scents and had to record what they smelled like, and a “Savant Questionnaire” examining special skills. The various research projects will continue this coming summer and we will be writing up the results for publication. We will let everyone know when the Mobile Lab comes to your area. Learn more about our mobile lab studies. In the coming newsletters we will be highlighting particular questionnaires available through our website www.AutismResearch.com. In the meantime we invite you to login to see what questionnaires are available to be completed on your family members. The questionnaires are grouped under "My Projects". Please be sure to complete the questionnaires in the Core Project since these questionnaires are crucial for other research projects including genetics and mobile lab and other questionnaires. Go to www.AutismResearch.com and click "Login". If you can't remember your login information just click "Forgot your Username or Password?". You will be prompted to enter your email address. You will then receive an email with your username and a temporary password you can change after you have logged in. Thank you for being visitor number 20,814,158 since October 10, 2006.